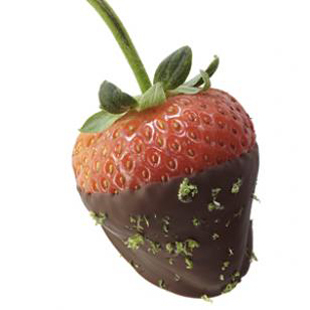 Here’s an easy 3-step method to make your own fancy dark chocolate-dipped strawberries or other chocolate-dipped treats this Valentine’s Day. Place about 1/2 cup bittersweet chocolate chips in a small glass bowl. Microwave on Medium for 1 minute. Stir, then continue microwaving in 20-second intervals until melted, stirring after each interval. Or melt in the top of a double boiler over hot, but not boiling water. Line a baking sheet with parchment or wax paper. Dip 1/2 to 2/3 of each dipper into the melted chocolate. Let the excess drip back into the bowl. Place on the prepared baking sheet. Sprinkle the topping on the chocolate. Refrigerate until set, about 30 minutes. Refrigerate fresh fruit in an airtight container for up to 1 day. Store pretzels, crackers and dried fruit airtight at room temperature for up to 3 days.